Though the ritual of scanning credit cards into iPads, scrolling through menu options on a screen instead of on paper and placing an order on technology is the new normal, at Eatsa, a new high-tech quinoa restaurant on Telegraph Avenue, customer questions on how to navigate their humanless front-of-house interface are frequent. This shouldn’t be a surprise, though, because ordering food from a cubby managed by a robot feels odd and foreign at a restaurant, a space where food has done what it’s meant to do — gather people together — for countless years now. In a typical restaurant, human interaction is easy to come by whether through an exchange with a cashier or a host or even watching chefs prepare dishes. At Eatsa, a cubby door opens and in slides — almost magically — a bowl of quinoa jazzed up with flavors ranging from Asian miso to Mexican chili and lime. The perceived benefits of replacing human front-of-house staff with robot delivery are multiple: fast turnaround times between ordering and receiving, a cheaper price ($6.95 per bowl) and no lines. There is an undeniable novelty about Eatsa’s automated service that attracts UC Berkeley students. But eating food is as much of a chance for meaningful social interaction as it is a necessary mode of nutritional intake. Eatsa may provide better quality fast food in less time and for a cheaper price, but in lacking a mostly human staff and a transparent kitchen, Eatsa compromises our connection to our food and actively perpetuates a fast food culture that ignores the ability of food to function as means of meaningful human interaction. This shouldn’t be a surprise, though, because ordering food from a cubby managed by a robot feels odd and foreign at a restaurant, a space where food has done what it’s meant to do — gather people together — for countless years now. The biggest issue with Eatsa is not so much the type of food it serves but how it is being served. Whitney Witthaus, a UC Berkeley student studying injustice in the food system and food policy, describes this predicament as “eating the right food but in the wrong way,” an idea proposed in Alice Waters’ manifesto for food justice, “A Delicious Revolution.” Eatsa may be hip enough to stray away from meat dishes in its menu, but its efficiency and low price encourages customers not to make time to “stop and spend quality time with people,” according to Bri Caspersen, a student involved with the Student Organic Gardening Association. To truly enjoy a meal, the food needs to be tasty, but the social connection — the feeling of community between people sharing a meal together — that arises from a meal’s tastiness gives food its value. Severely limiting human interaction in the front-of-house, as Eatsa has done, makes it increasingly difficult to appreciate the food being eaten because the food is disconnected from a human context. According to Witthaus, “adding robots to the equation is dangerous” because it exacerbates this problem even more by eliminating the need for human food service employees almost completely in the restaurant. And not seeing food prepared and handled by humans makes it difficult to feel socially connected to our food and disincentivizes acknowledging the interaction between the consumer and the producer that is taking place. The sleek, white interior of Eatsa supports Witthaus’ observation: The kiosk is noticeably quieter than a typical restaurant. Though music plays in the background, no line of people waiting to order means there isn’t a continuous stream of chatter inside the store. There is no ching of a cash register, only the quiet hum of cubbies opening and closing. Still, Eatsa has tried to make the ambiance of the restaurant more inviting by having the iPads ding and chime when someone touches the screen and by programming the cubbies to flash with cartoon images of quinoa bowls and a customer’s name when his or her order is ready. Some of the cubbies even say, “Don’t be shy, give that bowl a shake!” mimicking the dialogue a customer would have with an enthusiastic cashier about a purchase. The company also employs concierges with the dual purpose of making sure the cubbies and iPads operate smoothly. Even though they don’t seem to do much, the staff appear to facilitate the inviting atmosphere most restaurants use to encourage people to eat out. The use of concierges and interactive technology may allow Eatsa to compensate for the lack of human interaction, demonstrating the developers’ understanding that social environment is an integral part of the dining experience. Even though Eatsa prioritizes efficiency and ease of use, the business can’t afford to be completely utilitarian — the pleasure derived from the social component of eating is too deeply ingrained in the human psyche to deny. 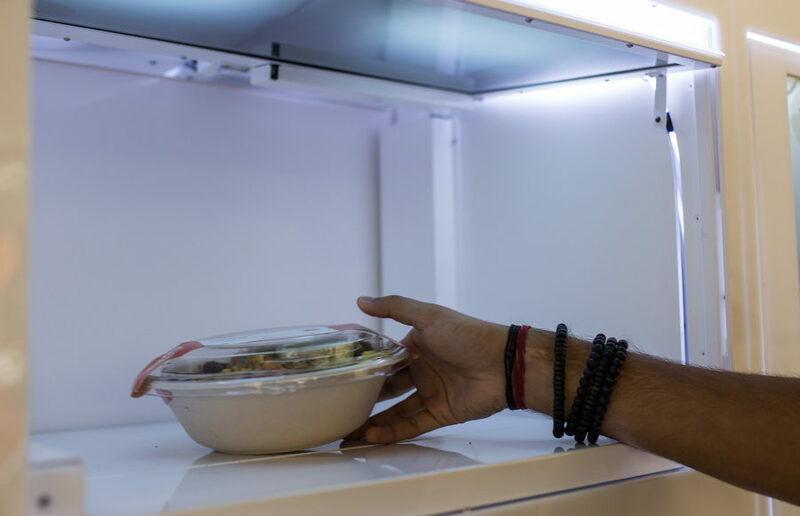 The company has stated in its blog that its goal is to “democratize access to nutritious food.” By using technology to increase production efficiency, reduce wait times and by substituting meat for plants, Eatsa is able to provide healthy meals for people who may not otherwise have the time to eat a nutritious meal or who would like to spend less on lunch. But these benefits are only open to customers working and living near Eatsa locations, three of which are in the Bay Area and one in Woodland Hills in Southern California. Eatsa also only takes credit cards, which excludes customers who are more reliant on cash. Eatsa’s goal of increasing accessibility to healthy food makes the company seem more socially conscious than other fast food franchises. And while Eatsa does make socially conscious choices by using quinoa, a sustainable plant, and by keeping its dishes completely vegetarian, its design capitalizes on efficient production and convenience, which are values shared by other fast food franchises. For all of Eatsa’s novelty in design and product, the restaurant isn’t breaking the trend of treating food as a substance to be solely ingested. Eatsa remains in the fast food category because it removes any sort of human interaction that would otherwise allow the chain to potentially revolutionize how we consume food in this day and age. I tried the Bento Bowl and while it was well-flavored, the quinoa was hardly the star of the meal. The power of food is in its ability to sustain us not just physically but also emotionally and mentally by cultivating a sense of community and shared experience with others. Food is a stage for connection and conversation, and in our highly digital society, sharing a meal remains one of the ancient ways we participate in direct human interaction. Eatsa provides a service to the UC Berkeley community by feeding many hungry students who have tight budgets, follow rigorous schedules and need something nutritious to keep them going all day. But no restaurant — Eatsa included — can deny the weight of the time-honored tradition of preparing food for other people as a twofold way to both give and receive, of being a part of a larger community. Eatsa will almost certainly be a financial success, but Eatsa will not nourish relationships between students or create experiences that will be remembered and recalled fondly the way a traditional restaurant would.